After staying at St. Margaret's Anglican Guest House we boarded the bus and Ellen started our day by reading Psalm 92. "It is good to praise the Lord and make music to your name, O Most High..."
Our first stop was Sepphoris, a major Jewish city during Jesus' time. We started at a partially restored synagogue with mosaic floors. Ellen explained the style and orientation of synagogues, and the three parts of the Jewish Bible (our Old Testament). The first 5 books are the Law, the second section is the Prophets, and the rest are the Writings. 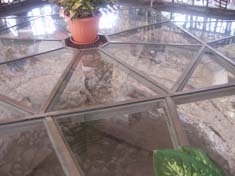 We saw typical three sided dining rooms (triclinia), numerous ritual baths and public buildings with more mosaic floors. 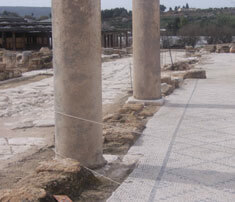 The main roadway pavement was stone blocks, marked by ruts from chariot wheels. 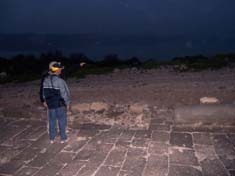 It was amazing seeing so much that was from the biblical past and would ha ve been the same in Jesus' time. A few of us took a side trip into a Crusader-era building to climb up to a balcony where the same guide who had let us into the synagogue earlier wanted to show us the wonderful view. 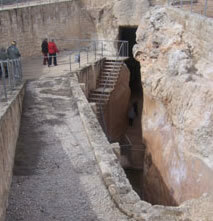 The Sepphoris water system had two open channels that diverted water from two springs on Nazareth mountain into a large settling pool. This overflowed to a large plastered reservoir where it was distributed through lead and clay pipes (yet to be fully excavated). We then traveled to kibbutz Ginosar on the Sea of Galilee where we took a boat ride on a replica of a boat from Jesus' time. The American flag was raised in our honor and the ride was pleasant, with singing and dancing, as we all enjoyed the afternoon. Back on dry land we toured the museum containing the remains of the two thousand year old "Jesus Boat," which was found in 1986 and excavated from the nearby lakeshore. After our lunch we visited the Church of the Miracle (loaves and fishes) that was built over an earlier Byzantine church. Then on to Capernaum, which was the center of Jesus' earthly ministry. This city was divided into insulas (city blocks). We saw a synagogue and a residential area. The foundations of an early Byzantine church created two octagonal stone walls around St. Peter's house, which is located here. Above St. Peter's house there is now a modern catholic church, shaped like a boat, with a glass floor that allows you to look down into the remains of St. Peter's house. We then crossed over the Jordan River and drove into the Golan Heights. We hiked up a steep stone trail to the partially excavated ruins of Hippos/Sussita. The trail was lined with barbed wire and signs warning of land mines. Ellen told us not to take this lightly. Entering through the old gateway onto the main East/West roadway paved with basalt blocks, we saw remains of churches, with mosaic floors, and columns of limestone, black basalt and red granite. There was a rose granite reliquary, marble panels and a stone sarcophagus of a woman whose bones had shown signs of osteoporosis (Ellen told us). It was very dark, windy and cold as we made our way back down the trail to the bus. The lights of Tiberias shining across the Sea of Galilee were beautiful. We had dinner and stayed at Kibbutz Ein Gev, on the east shore of the Sea of Galilee below Hippos/Sussita, for the evening.